Telecom & Data introduces Clear Voice™ planar speakers for emergency and general paging in manufacturing, sports stadiums and entertainment venues, and police and fire operations use. 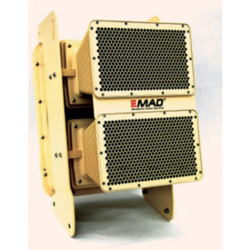 Originally developed for military applications, planar speakers deliver an unprecedented level of clear voice communication over distances greater than a mile, even in very noisy environments. Clear Voice planar speakers can save lives by delivering loud and extremely intelligible messages via a compact speaker. They are ideal any time there’s a need for voice communication in a loud environment, a large coverage area, or a long distance. Telecom & Data offers Clear Voice planar speakers that throw sound for distances of 100 yards, 140 yards, 250 yards, and 650 yards. The power and exciting ingenuity of this disruptive technology is hard to convey in words. Magnetic planar technology disperses sound waves differently – more like a beam of light, so sound waves do not scatter as the sound moves away from the speaker. As a result, the speaker transmits sound much farther without losing clarity. In fact, the acoustics become more powerful as the listening distance is extended, up to a mile. Clear Voice has integrated magnetic planar technology in mountable speakers designed for demanding environments such as manufacturing plants, distribution centers, sports stadiums, college campuses and concert and festival venues. Small, portable and durable hand-held speakers are available for police, fire and search-and-rescue operations – anywhere long-distance clarity and intelligibility are key. Clear Voice speakers can be installed separately or as an addition to existing paging systems, with three options for connectivity: Wireless, IP paging and analog. Fewer planar speakers are needed than conventional speakers, which reduces installation time and costs. Manufactured in the United States, Clear Voice speakers are weather-proof and built to deliver consistent, superior performance even with heavy-duty outdoor use.